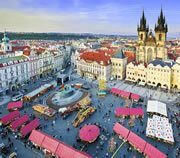 The Prague Easter markets are open daily at the Old Town Square and Wenceslas Square. Visitors can browse the stalls for handcrafted goods, taste hearty food and local drinks, and discover Czech Easter traditions - Easter photos. 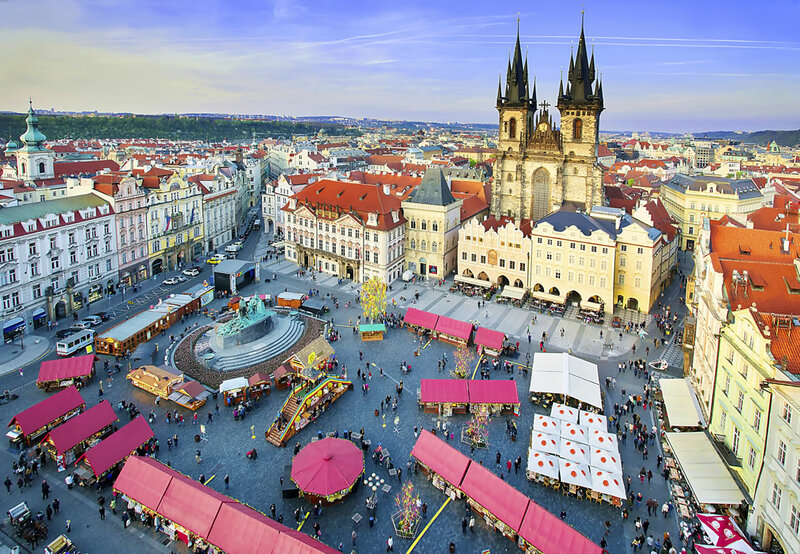 The Easter markets (Velikonocni trhy) celebrate the arrival of spring in the Czech Republic, and the Prague markets are the most impressive in the country. They brighten up the city, bringing locals and tourists together in an uplifting, historic setting. 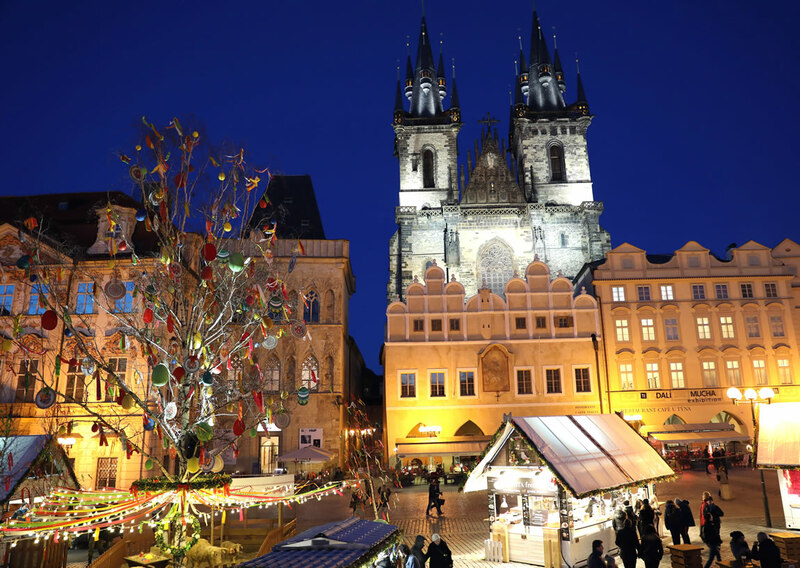 The Prague Easter markets are open every day from 06th to 28th April 2019, including on Easter Friday, Saturday, Sunday and Monday. Note: The Prague Castle Easter market is open from 04th April to 05th May 2019. 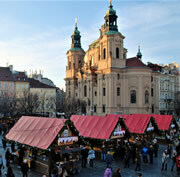 What are the Prague Easter Markets? 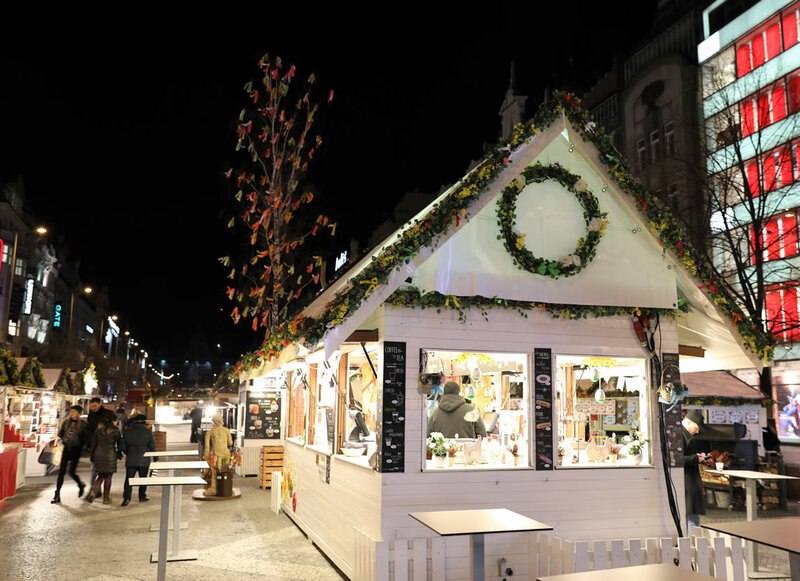 The Prague Easter markets consist of wooden huts decorated with the vibrant colours of spring, and stocked with local handicrafts - glassware, jewellery, embroidered lace, wooden toys, ceramics, scented candles, and puppets and dolls dressed in traditional costumes. 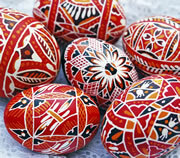 Most common though are Easter eggs, which are hand-painted in a variety of colours and designs. The squares are dressed with colourful ribbons and are abundant in flowers and blossoming trees. An observation bridge at the Old Town Square is traditionally decorated with branches of birch trees, ribbons and a sea of flowers. Drinks hut, Easter markets While visitors should find some nice souvenirs, the markets are not just about shopping. 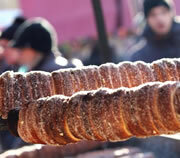 You can also sample all manner of local food and drink, and observe traditional snacks being made. 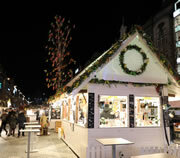 Outdoor shopping is so much nicer with an ice-cold beer or mug of hot mulled wine in your hand! The general ambience of the markets and the food on offer will appeal to children. But there is also a farmyard pen to visit, to feed and stroke animals such as sheep, goats and a donkey. Even an alpaca can put in an appearance. 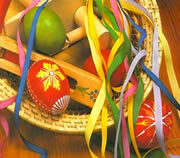 There are opportunities for kids to join in Easter themed activities too. Children can be invited on stage at the Old Town Square to paint Easter eggs and flower pots, cut colourful ribbons, make Easter chicks, and weave traditional Easter baskets and whips. Easter market at Wenceslas Sq. The sightseeing, entertainment and nightlife is mostly located in these three areas too. 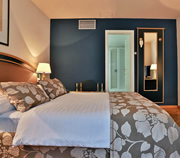 Therefore, book a hotel in Prague 1 and the Easter markets, sights and attractions, restaurants, theatres, concert halls and shops will all be nearby. And as the markets are free to enter, whenever you fancy dropping in you can leave your hotel and be in the midst of the action in minutes: grab a drink and a hot snack, browse the stalls, soak up the atmosphere, then when you're ready to freshen up, it's just a short walk home - Prague hotels. Around Easter, spring is undoubtedly in the air. Expect long spells of warm, sunny weather interspersed with dull days and heavy showers. On fine weather days visitors will find cool shirts, shorts, skirts and dresses most welcome. Bring sunscreen, sunglasses and hats too. In case of a cold snap or rain, bring a warm fleece and a waterproof jacket or umbrella. And Prague is a wonderful city to explore on foot, so a comfortable pair of walking shoes is also a good idea. Sightseeing in Prague is enchanting, with ancient monuments and magnificent squares to explore, and a dramatic history to uncover. The colours of spring bring the city to life around Easter, lending it an even greater charm than usual. The sights and attractions are open every day throughout the time of the Easter markets, aside from on Good Friday and Easter Monday (see below). 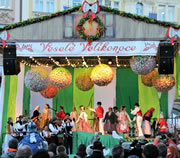 There is a range of entertainment on offer throughout the time of the Easter markets. 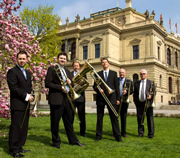 We particularly recommend attending a classical concert, which are held in churches and other historical buildings, and are magical at this time of year - Prague classical concerts. The opera and ballet season is also in full swing. And for a typically Czech experience, black light and marionette theatres stage shows suitable for all ages and nationalities - Prague theatre. Meanwhile, the Medieval Tavern and Traditional Czech Night showcase the best of Czech hospitality. 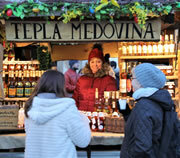 The Easter markets are open every day over Easter. All sights and attractions are open on Easter Saturday and Sunday. Only certain sights are open on Good Friday and Easter Monday, and usually with limited opening hours. The sightseeing tours, walking tours and river cruises operate every day. The shops are open on Easter Saturday and Sunday. Only certain stores open on Good Friday and Easter Monday, and usually with limited opening hours. Restaurants, bars, cafés and clubs are open every day. For dining, we advise making a reservation (many restaurants will be booked out). You can see what menus are available and make reservations in our restaurants section. 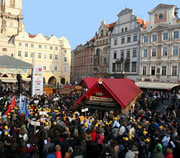 Please note: Prague is a popular city to visit over Easter and many venues and tours sell out. Therefore, reservations are recommended for any form of sightseeing or entertainment you may wish to participate in. The Easter markets date back to the Late Middle Ages, when they were deeply tied to religious festivities. However, in the communist era in the 20th century the markets suffered a demise, as the religious aspects of Easter were banned and consumerism was frowned upon; Easter celebrations were limited to the welcoming in of spring. Since the fall of communism and the liberalisation of the country, the markets have enjoyed a renaissance. Czechs and tourists alike gather in their thousands today, to browse the colourful market stalls and soak up the atmosphere. Children finish school on "Ugly Wednesday." The following day ("Green Thursday") boys equip themselves with wooden rattles, called "rehtacka". They then form a group and walk through their local village or town, shaking their rattles vigorously. This, as tradition dictates, scares off Judas. The same walk is repeated on "Good Friday" and once more on "White Saturday". On Saturday, progress is slowed by the boys stopping at every house and shaking their rattles until they receive a present! The greatest symbol of Easter is the egg, with its connections to spring and new life. 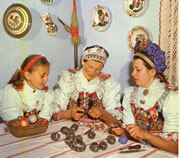 On Easter Sunday, the girls and women of the village decorate Easter eggs ("kraslice"). This is a skilled affair with many variations on the decoration: a mix of watercolours, picture stickers, bee's wax, straw and/or feathers. 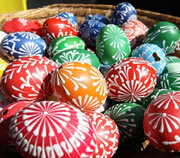 For particularly well decorated eggs there is even an Easter egg contest held annually in Prague. As girls paint their eggs, the boys prepare their Easter whips ("pomlázka"), ready for Easter Monday. This is not the kind of whip used on horses, but is made from osier twigs, braided together. Once again, this takes some skill to make and the more twigs, the more difficult it is to braid a whip. On Easter Monday people get up early, and the boys and men set off on a whipping trip through the village. Boys stop at various homes and whip the legs of every girl and woman who live there. Small boys are required to recite an Easter carol as they go about their whipping. As if the whipping is not enough, an old custom is to also grab the girl and throw her in a bath of cold water, known as an "Easter dousing". The whipping and dousing is performed to chase away illness and bad spirits - although she may not appreciate it at the time, all this is supposed to be good for the girl! Once the whipping and dousing is over, the girl rewards the boy with one of her painted eggs. She then ties a bright ribbon around his whip, before he moves on to the next house. As the boys progress through the village, their bags fill with eggs, and with so many ribbons attached the whips become ever more colourful. In recent times, for older boys gifts of eggs and ribbons have given way to offers of shots of alcohol. By the time they arrive home, these young men can be in a fairly happy frame of mind!